I don’t want to spoil the surprise but I’ve never seen this happen. Maybe I just haven’t eaten in the right restaurants. Oceania Sirena has two specialty restaurants where reservations must be made. There is no extra charge – in fact, there are few extra charges at all on this cruise ship. 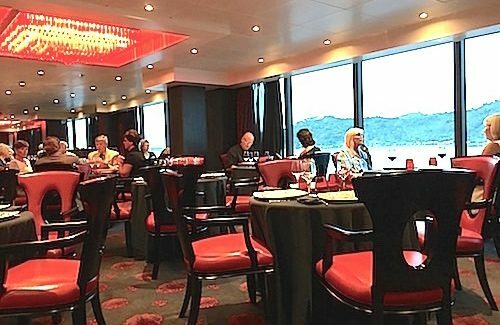 Most passengers can expect to dine at least once in Red Ginger and once in Tuscan Steak. If the restaurants are not booked up, passengers may be able to reserve another dining adventure. As one of the first few in line when Red Ginger opened, I was treated to a song by the waiters. I don’t know what they were singing as they stood in line but it was entertaining. Then they bowed and welcomed us. The décor of Red Ginger is red and ebony, very sleek and Asian with plenty of window views and a glistening red crystal chandelier overhead. The atmosphere is tranquil. Waiters are dressed in black with mandarin-collar jackets. Diners are expected to enjoy leisurely meals. My favorite maître d’ Susan Lingao was working in Red Ginger and led me to a wonderful table for one by a window where I could watch the ocean roll. I’ve said it before but I appreciate Sirena’s courtesy to solo travelers. That does not happen on all cruise lines or in all restaurants. My favorite waiter Yasa also was working in Red Ginger and brought me a menu. Then waitress Myat placed an “amuse bouche” in front of me – a miniature tureen of edamame beans with sea salt. Next was that little surprise I mentioned. Myat plopped what looked like a small mint in a shallow white porcelain bowl. When she poured hot water on the tablet, it rolled over and expanded in all directions and smelled like lemons. That was my finger towel to use before and after eating the edamame with my fingers, Myat said. Myat also brought a tea menu. I’m not much of a tea drinker but this was special. I appreciated that the menu had a short description of the teas, how long each tea should be infused and whether it had caffeine. Selections included green tea, white tea, black tea and herbal tea. I chose caffeine-free ginger lemongrass. The tea was served in a heavy carved cast iron teapot with a little “leaf” poking out of the pot. That was the tea bag. The tea was refreshing and delicious. Red Ginger also offers wine and sake. Myat then appeared with a wooden box filled with an assortment of colorful chopsticks made of everything from silver to porcelain. Next was choosing soup, salad, appetizer, entrée and dessert from a huge and mouthwatering menu. It would take too much room to share the whole menu but I can tell you what I chose to give you an idea. Yasa told me that I could make my dishes as Asian spicy as I wanted, just to let him know. And if something was too mild or too spicy, Yasa would take it back and the chef would adapt a new dish to my taste. I started with Tom Kha Gai soup with chicken, lemongrass and coconut milk. Salad was avocado lobster with crispy lotus, lobster, avocado, tuna, hamachi, den miso and shiso vinegar. Both were great. Couldn’t pass up the sushi chef’s selection for appetizer – eight pieces of assorted sashimi and sushi rolls, plus ginger slices and wasabi. Some of the best I’ve ever eaten. Fresh, wonderful and big. It could have been my meal. Entrees were divided into seafood, meat and vegetarian categories. Meat courses included ribeye steak, rack of lamb, pork luc lac, all prepared in an Asian way. Seafood choices were miso glazed sea bass (said to be the most popular), sole tempura, lobster pad thai, bay scallops or red snapper. I chose the sea bass and could easily see why it is the most popular. Dessert choices were crème brulee, Japanese fruit salad, steamed ginger cake with apple cardamom ice cream, Bounty Cake with coconut, chocolate chips and vanilla beans or caramel tapioca with ginger cookies. I chose the ginger cake and am glad I did. After such a big and flavorful dinner, you might think I wouldn’t be able to eat dessert. I ate all the ginger cake and ice cream. On the way out of Red Ginger, I received another surprise. Some good news from maître d’ Susan. Since I like to dine early, Susan said it looked like Red Ginger would have another reservation open in two nights. Would I like it, she asked? You bet I would!